During the 1992 presidential campaign, which took place during the end of a recession, Bill Clinton's team had a saying: "It's the economy stupid!" The people in that successful campaign wanted to remind each other over and over that the way to win the presidency was to focus on the economy, the economy, and the economy some more. When I hear people, especially people who are considered experts, giving us their brilliant ideas as to how we can fix the problems of education in America, I want to shout out to them, "It's the students, stupid!" When "the experts" bemoan the state of American education, there is no more attractive target for their attacks than teachers. In February, Time Magazine ran a cover story titled, "How To Make Better Teachers," complete with information on how other nations like Finland do it. The very clear implication of articles like this is that American education would be just fine if only our teachers were better. Jay P. Greene, a consistent critic of American public schools, now has a blog, and you'll never guess what he has posted about! Surprise, surprise! Greene has posted about the need to get better teachers into our schools. Argh!!! Now let me make it clear that I am all for doing everything we can to get the best teachers we can, and I have had a number of posts dealing with how I think we can do that. I am also very open to the idea that many of the methods and ideas that have been promoted by education schools and university high brows have been questionable to say the least. But anybody who spouts the theory that the biggest problem we have in education is that we don't have good enough people doing the teaching is barking up the wrong tree. A new report from the McKinsey Company examines education systems from around the world, revealing some of the central problems of the American system in the process. In international examinations of student proficiency in mathematics and science, American elementary students score fairly well. American middle school students slip to the middle of the pack while American high school students rank near the bottom, behind all of our major Asian and European competitors. South Korea in fact engages in remarkably different education practices when compared to the United States. South Korea spends less per pupil, but pays their teachers more. This feat is accomplished through larger average class sizes- which are approximately twice as large in South Korea than in the United States. This is a prime example of an expert who doesn't have a clue because he's never actually had to teach in an American public school classroom. It is so frustrating because so many people take guys like this seriously. Now, I'm not going to object to higher salaries for teachers, but I have a question for Jay. If the heart of American education problems is lousy teachers, then why do our third graders do well? Do all of our "smart" teachers flock to the early elementary grades? Do all of our "stupid" teachers flock to the high schools? It seems to me that Greene doesn't even attempt to explain this, so let's take a look at it. The biggest difference between kids in the early grades and in high school is the way they react to adults compared to the way they react to their peers. Pleasing their parents, and pleasing what amounts to be their surrogate parents, in other words, their teachers, is very important to kids in kindergarten and kids in the first, second, and third grades. Pleasing their peers becomes increasingly important as they get older. By the time they are in high school, peer relationships dominate. Greene uses South Korea as his example. I can't claim to be an expert on South Korean education, but let me take a couple of guesses. My guess is that South Korea does not treat a student's education as a property right that can't be taken away without due process of law. I would also guess that there aren't many teachers and administrators in South Korean schools that would ever have to worry about being sued if they suspended a student for too long, or disciplined the student in some other way. Well, that is the way things are in American schools, and believe me, it takes its toll on education here. It begins to make a noticeable difference when kids are in middle school, and by high school when the most difficult kids in our schools have learned what they can get away with, and when students are much more concerned about how their peers see them than how their teachers do, the effects are profound. Without ever having seen a South Korean high school, I have no doubt that teachers have much more authority and order in their classrooms, and I doubt very much that it's because they are superior people to American high school teachers. I think I have as good a reputation as any teacher in our school, but there was one class I had this year that was nearly impossible to manage, because there were so many kids who were disruptive, and there were so many kids who lacked any motivation at all. I don't care who the teacher is, learning is going to suffer in such a class. I would challenge any teacher from South Korea, Finland, or anywhere else to do a better job with that class than I did. Jay Greene scoffs at the importance of class size, and you know what? When the kids in a class are motivated and respectful, he's right. The best regular American History class I ever had was one of the largest classes I had ever had up until that time. Most of the students had wonderful attitudes, and the few who didn't were influenced for the better by the many who did. I have also had lousy classes that were relatively small, because there were a few disruptive kids in them. But in the great majority of classroom situations in America, whether Greene understands it or not, there is simply no question about it--a teacher can be more effective when a class is smaller. I have all of our school's sophomores in American History. This year I have the one nightmare class I referred to earlier, two other regular classes that are below average in performance and behavior, and one basic class. The basic class has actually been the most enjoyable of the bunch for me. The sophomore class this year is the worst class of students, as a whole, that I've had during my thirty-four year teaching career. I've actually grown to like almost all of the kids as the year has gone by, but I've never been so frustrated so often during a year. I'm sure there is more than one reason for this, but as I've tried to find out why this is, one thing has struck me. Because of cuts our school district has been forced to make, these kids have been stuck in large classes all the way up. Don't try telling me that class sizes don't make a difference. Somebody needs to tell Jay Greene that this isn't South Korea. Okay, I admit it. I'm probably being a little touchy. This morning I got this email from what I consider to be a very well meaning group, The Forum for Education and Democracy. The email was announcing the release of something called "Democracy at Risk: The Need for a New Federal Role in Education Policy." What bothered me was its list of featured guests. As a teacher, I think that one major thing wrong in education is that so many policies--many of them well-meaning--have been imposed on us by people who are considered "experts," but who actually know very little or nothing about what really goes on in a classroom. Wouldn't it have been a good idea to include at least one classroom teacher in a group called together to respond to another new plan for education policy in America? Joanne Jacobs did a piece the other day on another bashing of our education system. The bashing was a post by John Leo, and mercifully, this one seemed to focus more on college than it did in K-12. The post featured what was supposed to be a test for eighth graders in 1895, and it was compared to what today's college students don't know. "Nearly half of a recent class could not name a single country that bordered Israel. In an introductory journalism class, 11 of 18 students could not name what country Kabul was in, although we have been at war there for half a decade. Last fall only one in 21 students could name the U.S. secretary of defense. Given a list of four countries - China, Cuba, India, and Japan - not one of those same 21 students could identify India and Japan as democracies. Their grasp of history was little better. The question of when the Civil War was fought invited an array of responses - half a dozen were off by a decade or more. Some students thought that Islam was the principal religion of South America, that Roe v. Wade was about slavery, that 50 justices sit on the U.S. Supreme Court, that the atom bomb was dropped on Hiroshima in 1975." There were a couple of problems with Leo's bashing attempts, however. First of all, the eighth grade test turned out to be either a complete hoax or just dishonest. (Joanne reported that it's a hoax; a commenter on Leo's post said that it really was an eighth grade test from 1895, but hardly any of the eighth graders passed it.) The other problem is that by comparing the lack of social studies knowledge the college students demonstrated with any test, real or imaginary, it's clear that he completely misses the point. The problem is not that young people today can't do well on a particular social studies test that they can study for. The problem is that they can't answer the same questions just a few months, or even a few weeks, after they've taken that test. The reason? They don't care! They don't care what countries border Israel, they don't care about Afghanistan, and they don't about the Civil War. Do I care that kids don't care? Absolutely. I do everything I can to try to get my kids to care about the stuff I teach, and I know I'm not alone. But let's face it; we are not living in a culture that is conducive to getting young people to care about what has happened in history and what is happening in societies outside their own. But give them a test on TV, DVDs, video games, how to text, or how to use any other of the latest high tech gadgets, and they will dazzle us. How in touch are our unions? I am not anti-union. I want to make that clear before I say anything else. I certainly don't feel like I'm overpaid, but I know that I would be getting paid a lot less, and my life would be a lot less comfortable if there were no such things as unions. Nevertheless, I sometimes wonder how in touch our teachers' unions are with teachers. I was reminded of that when I checked out NYC Educator's blog next week. The post dealt with an article in Village Voice about Randi Weingarten, the president of the United Federation of Teachers. [Barton claimed] she "taught, sometimes full time, sometimes part time, at Clara Barton High School for six years." Actually, records reviewed by the Voice indicate that she taught 122 days as a per diem teacher from September 1991 through June 1994, roughly one in four days. She then did what she told the Voice was her only full-time term in the fall semester of 1994, followed by 33 days as a per diem teacher in the spring of 1995. Strangely, while she told the Voice she was a per diem for the 1995-96 and 1996-97 school years, her records list her as a full-time teacher. Because she was credited with the required two years of full-time service she doesn't even claim she performed, she was given a permanent certificate in September 1996. She has been on union leave since 1997, accumulating a total of nine years of pensionable city time though she only did one semester of full-time teaching. I have no idea what the statistics are on this, but I wonder how extensive the actual teaching experience is of all the leaders of of our teachers' unions and how recent that experience is. I believe this matters. After all, I know how I am. I've found that even when I get away from teaching for a couple of months, I start to forget. There have been times when I've gotten a "great idea" for an activity or adding something to my curriculum in August, and then when I go to implement it, I suddenly realize that there is something about the actual classroom situation that I had forgotten to take into consideration. My "great idea" either fails miserably or has to be altered considerably. The point is that as soon as you stop being in the classroom regularly, you lose touch, and so the things that are important to actual classroom teachers might not be the things that are important to our union leaders. Two issues come to mind on this. First of all, seniority and tenure. Our unions have historically fought tooth and nail to protect those, and while I think most teachers support them, I've found that it is by no means unanimous. Many young teachers certainly aren't big on it, since they end up being the ones who get cut during tough financial times regardless of how good a job they do. Some of those young teachers have parents who are still teaching, so they now feel much more personally the unfairness of that, and many good teachers, regardless of their age, don't see tenure and seniority as being important to them. I must admit, however, that there are also good teachers who do strongly believe in tenure and seniority. In any case, I think it's fair to say that tenure and seniority is a much higher priority to the leaders of our unions than it is to teachers as a whole. On the other hand, I've talked to very few teachers who haven't agreed that we need more ability to remove certain kids from our classrooms. Ask them if this would improve education, and the answer will be something like, "Well, duh!" But our unions have done virtually nothing about that. I'd guess that if I wasn't in the classroom anymore, maybe I wouldn't care about that either. I believe that most teachers really do want to see their schools improve, but there are very few people outside of teaching who see our unions as being a positive force in public education. In fact, a number of books and articles have been written by people who insist that teachers' unions are what's wrong with it. Perhaps if our unions would get more in touch with what teachers really want, that could be turned around. It would be fair to say that there are a few themes that recur over and over again on this blog. One of those themes is the effect that students have on other students. I hammer away at that so much because I think it might be the single most important factor in the education that takes place at the high school level--even more important than the quality of the teachers--yet it is completely ignored by reformers and policy makers. Usually when I write about this topic I harp on the destructive effects that disruptive and apathetic kids can have on a classroom. I think that's terribly important, but I don't write enough about the positive effects that good students have. Well, here are updated stories about two former students of mine who demonstrate the wonderful effect that good students can have on other students. I originally ran them as separate posts in June of 2006. One reason I'm running them again now is because I think I've got some readers that I didn't have back then. But the other reason is that the star of the first story, T. J. Oshie, will be in the national spotlight this week. The story about T. J. tells how a group of students can help direct an individual student in the right direction, and the second story tells how an individual student can have a profound effect on an entire class. This is T. J. Oshie. This week T. J. will be playing for the University of North Dakota Fighting Sioux in the Final Four of the NCAA Hockey Tournament. T. J. was one of the captains of Warroad's 2005 state championship team, and he is the most talented hockey player I have ever coached. 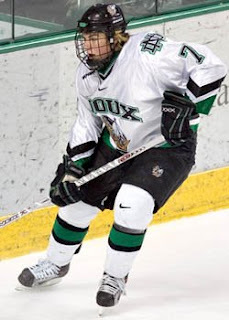 Because of his accomplishments in high school, he earned a full scholarship to UND, and he was a first round draft choice by the St. Louis Blues of the National Hockey League. In addition to his wonderful talent, T. J. is one of the most enjoyable kids I've ever had the opportunity to work with. Many of our hockey practices at Warroad were grueling, but I've never seen anyone work so hard, yet have a smile on his face nearly all of the time while doing it. The spirit of joy that he brings to the game is contagious, and he boosts the morale of any team he plays on. But T. J. is also a classic example of what having peers who are good students can do for an individual. T. J. moved with his dad to Warroad from the state of Washington at the beginning of his sophomore year. I had him in my American History class, and he was not a good student. His effort was rarely better than mediocre, and I put him on our school's scholastic ineligibility list a number of times. If he'd have kept going the way he started at our school, I firmly believe that he'd have never been able to play hockey at a college. But T. J. was very lucky because he came to our school at exactly the right time. T. J. 's number one love was hockey, and it would be the hockey players in his class--the class of 2005--who he would end up spending much of his time with. It just so happens that this group of hockey players were not just good athletes; they were an exceptional group of students. 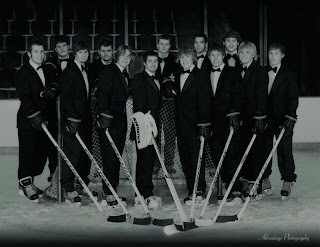 Here is a picture that this group of hockey players had taken during their senior year. In order to avoid confusion and make my point, as well as to shorten things up a bit, I will only go through the players in the front row. I want to point out that if I say that a student was on the A honor roll, I mean that he was consistently on it, and not just for one or two marking periods. On the far left is Kyle Hardwick. He was a defenseman, president of the senior class, and an A honor roll student. Kyle is now going to school and playing hockey at Bemidji State University. Next to him is Josh Brodeen, who was T. J. 's right wing, and a B honor roll student. He is now a student at UND. Then, Eric Olimb, a defenseman, T. J. 's best friend, and an A honor roll student. Eric is now going to school and playing hockey at the University of Nebraska, Omaha. Next is Mark Thiele, our goalie, and an A honor roll student, who is now attending University of Minnesota-Duluth. Next is T. J., then David Larson who was a defenseman and a B honor roll student. David is now a student and hockey player at the University of Wisconsin-Stout. Next is Andy Brandt who was our third line center and a B honor roll student. Andy is now in our armed forces. Finally, on the far right is Ben Bengtson, T. J. 's left wing and an A honor roll student. He also is a student and hockey player at Wisconsin-Stout. Believe me, our hockey players usually don't get grades like this (I wish they did! ), but this was a very special class. These are the kids that T. J. would be hanging around with for three years, and when you hang around with kids like this, good things happen. So by the time this picture was taken in January of 2005, T. J., too, was a member of the A honor roll. Qualifying academically at UND never became an issue. The one who deserves the most credit for T. J. 's success is T. J., himself. He is a young man who is very human and makes mistakes like the rest of us, but what talent, what personality, what a work ethic, and what character he has! And when you have big hopes and big dreams, it sure helps to have great friends to help you along. That is something T. J. was definitely blessed with. After the NCAA hockey tournament is over, it is expected that T. J. will sign a contract with the Blues, and he will make more money in one year than I've made in my whole life. When that happens, will I be jealous? Heck no! In fact, I couldn't be happier and prouder. T. J. could have signed with the Blues a year ago, but he turned down all that money because he wanted to go back to UND and try to win the national championship with his friends. He is that kind of person. T. J. Oshie's story tells how a group of good students can affect an individual. But is it possible for an individual student to have a significant influence on a class? The answer is a resounding, "Yes!" Having Nick in my class taught me that lesson very well. Class discussion is an important part of almost any social studies class. There is nothing like a good class discussion to make otherwise dry material meaningful to high school students. But there have been times when I've conducted class discussions on the same subject on the same day, and gotten completely different results in different classes. In one hour, there will be a number of kids who jump into the discussion with both feet, and my most difficult task is to keep the kids from interrupting each other. Then, in the next class, it might be like pulling teeth just to get a few kids to say, "Yeh," "Nope," or the ever popular, "I dunno." The difference in the class might be made by only three of four students, and sometimes it can be just one. Like T. J. Oshie and his friends, Nick was a member of the Warroad High School Class of 2005 (Yes, that was quite a class! ), so I had him in one of my American History classes six years ago. Nick was a big, bright, good-natured young kid, and I've never had a student who was better in class discussions. Every teacher knows what it's like to have kids walk into class and say, "Do we have to do this again?" when they find out what is planned for the day. Teachers in our school never had to worry about hearing that when Nick bounded into class. In fact, any day I had class discussions planned, I could count on hearing him say something like, "I love these!" As a teacher, I'm here to tell you that makes you feel pretty good. Nick loved to laugh and he loved to argue, and he was one of those rare teenagers who could get himself to really care about things that happened 100 or 200 years ago. You want to talk about whether or not we should have gone to war with Britain in 1812? Nick could get fired up about it. Better yet, he could get other kids fired up about it. When Nick was in my class he would literally goad other students into getting involved. As a result, his class consistently had the best discussions of any of the American History classes that I had that year. There were a number of times that class would argue right up until the bell rang and then they'd continue the argument in their later classes. Some of the other teachers didn't appreciate it, but I sure felt good about it. Nick was a very special student. I am the sophomore class advisor, and one morning in December, our principal, Bill Kirkeby, called me out to the hallway from my first hour class. He said that we were going to have to call all of our sophomores into our mini-theatre to meet with them. I asked him why, and he replied that he was going to have to tell the sophomores that Nick had died. When his father had gone to his room to wake him up in the morning, he thought it was strange that Nick's reading light was still on. He had suffered an aneurysm sometime shortly after going to bed. Obviously, this was a terrible personal tragedy for Nick's family and many friends. His funeral was held in our gymnasium, and the next month was a very emotional period in our school. Mention Nick's name any time during the rest of the year, and some girls in my classes would break into tears. The sophomores on our hockey team had his initials pasted on the back of their helmets, and players on our other athletic teams did similar things. But besides the personal tragedy, Nick's death was also a real blow to the education that took place in our school. He was not just missed because everyone liked him so much and because of his fantastic personality; he was also missed because of the contribution he made in every class he had attended. My American History class that he had been in was never the same. It was still a good class, but it was never again what it had been when Nick was there. I can still picture in my mind students who took part in almost every discussion when Nick was there, but almost never got involved after he was gone. Our discussions in that class were just never able to take off the way they had before, because Nick was no longer there to get his friends going. Do good students make a difference in the learning of their classmates? You bet they do. Nick was a student who his classmates and I will never forget. Warning! A lot of teachers are going to disagree with me on this one. The best analogy I can give for this involves my hockey coaching. I am the only person in Minnesota high school hockey history to have been a head coach for a team that has gone winless, and then also for a team that has gone undefeated. In 1980 I coached a team in Mt. Iron, Minnesota that went 0-17, but it was not because I was a lousy coach. We had a very young team, and we were one of only a handful of teams in the state that had to practice outside. In 2005, I was the co-head coach of a team that went 29-0-2 and won the Minnesota Class A Championship, and although I think I did a pretty good job, that didn't happen because I was a great coach. We were loaded with talent, and we had one of the best practice situations in the state. There are many teachers throughout the nation who are dealing with situations in their classrooms that are at least as challenging as what I faced as a hockey coach in 1980, and they don't necessarily deserve to be fired. There are also some teachers who have classroom situations that are as wonderful as the one I had as a hockey coach in 2005, and they don't necessarily deserve merit pay. The teacher NYC Teacher talks about makes that point very well. Here is where NYC Educator and I part ways. Part of this is probably due to our different locations. I work in a small school district, so I know and like nearly all of our administrators, and I am at least acquainted with most of our school board members. NYC Educator, on the other hand, works in a system that might be the mother of all bureaucracies. That being said, I don't think teachers should be protected by tenure and seniority systems. NYC Educator says the the great majority of teachers are competent, and I agree with him. But as he acknowledges, there are teachers who have managed to get tenure who are awful. It has to be much easier to get rid of those teachers than it is now. No kids should have to be stuck with them, and they give all teachers a black eye. As one former teacher, who later became the chairman of the school board in a large suburban district in the Twin Cities area, said to me, "As long as teachers have tenure, the profession will never get any respect." I think there is a great deal of truth in that statement. There are two major problems that I see in our tenure and seniority systems. One problem is that some teachers become lazy as they gain seniority. They may not become "incompetent," but they quit working as hard as the should and they quit being as good as they should. Teachers, as a whole, are probably more altruistic in their motivation than most other employees, but we certainly are not immune from self-interest and laziness. The second major problem is the one that I see as the worst. When cuts have to be made, as happens at one time or another in so many school districts, the least senior teachers are the ones that have to go. Sometimes those younger teachers are the best in the school. Both of the school districts I've worked in have gone through periods when many cuts had to be made, and I've seen too many outstanding young teachers forced out the door, while teachers who weren't nearly as good and hard-working as them stayed. That is a tragedy. The answer to this problem, however, is not to make decisions about who to retain by using tests. There has to be some human judgement. About a year-and-a-half ago, I wrote a post dealing with how I think teachers should be paid and retained. In that post, I said that this should be the job of the school principal, but there were teachers who responded to that by pointing out that in some larger schools the principals are clueless about the performance of individual teachers. That may be true, but then it should still be the job of some person, probably an administrator. Would politics enter the picture if we did this? Of course. But all this would do is to put teachers in the same boat as millions of employees of private companies. I have two sons who work for private companies that have gone through periods in which they had to lay off employees. My sons had to impress their bosses enough so that they got to stay. I think teachers should have to do the same thing. Granted, this is a very imperfect system, but it would be hard to find a worse one than the one we've got now. Basing those decisions on how our students do on tests, however, comes darned close. Conferences: Who should be saying thank you? We had our final conferences of the year last week, and there is something I've started to do at them the last couple of years that I had never done before. And I should have been doing it all along. There are some students who are an absolute pleasure to have in class. They are conscientious, they are polite, they always seem to have smiles on their faces, and they are often a very positive influence on other kids in their classes. I have one sophomore this year who is the youngest of four children. I have had them all, and every one of them has been like that. It seems pretty obvious that parents of kids like this must be doing something very right. It is consistently the parents of kids like this who show up for conferences, and then at the end, they will frequently thank me for all I have done. They thank me? Shouldn't I be the one thanking them? I finally figured that out, and so now I thank those parents for having such great kids and trusting our school with them. Parents always look so surprised when I do that, but why should they be? I don't think it's ever been harder to be a parent than it is today. There are a myriad of influences coming from our society that work against what any good parent wants for their kids. Yet, they manage to overcome all of it. And if my blog has proven anything the last few weeks, it's that good parents don't have to send their kids to public schools. There ARE other options. So if you teach in a public school, the next time you see parents of one of those great kids that make teaching so rewarding, remember who is the one who should be saying, "Thank you!" Last weekend, I went to Education Wonks and found he had done a post on an incredibly depressing column by Colbert King about a public school in Washington, D.C..
Teachers need the power to remove unruly kids from their classes, and principals need more power to expel them. Quite frankly, some kids just don't belong in school. This is an extreme example of what happens when we feel like we have to save every one of them. It doesn't work, and it can lead to the point where no one can get an education. I have never been a fan of vouchers, and I wouldn't want to see them used in any district that has schools that have the potential to be a good ones, but how can anyone argue against them in this situation. Does anyone actually believe that a "new program" or more money could possibly turn a school like this around? Our priority must be to see to it that every kid who wants an education can get one. My first choice would be to see every violent and disruptive kid thrown out of this school, and I don't care how many that is. But assuming that isn't going to happen, in a situation like this, I would be happy to see my taxes spent to send kids who want an education to private schools. Something has to be done to separate those kids from the thugs who are, in effect, running this school.